Caravan park Darlowo "Przystań BIONIKA"
How to get to Darłowo? Apart from holiday houses, we offer you camp sites with the capacity of about 10 vehicles. Each vehicle can be connected to the electrical supply. There are public sanitary facilities equipped with toilets, showers with hot water (no additional charges) and sinks. 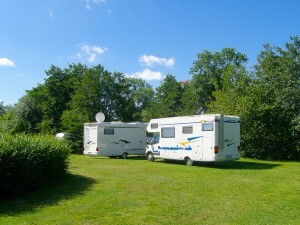 Our caravan park is situated by the picturesque Wieprza River, 20 minutes from the Baltic Sea on foot. From a nearby pier, a water bus may take you from Darłowo or Darłówko. – in case of stay of your guests who are not checked into the campground are specified in points 19 and 22 of the Terms and Conditions. Hot water, showers and sanitary facilities in the tent and caravan sites are available round the clock without additional charges. Payments by money transfer or credit card are handled by Dotpay.